I have been making mosaics with communities since 1997. In those 12 years, I have seen how the art form, which creates beauty from brokenness, offers not only a symbol of healing, but a rite of creating renewed wholeness for those who make the mosaic. I have made mosaics with groups dealing with domestic violence (either as victims or as those working to help the victims). I have made mosaics with students in preschool, elementary school, secondary school, college, graduate school, even seminary. I have made mosaics with teens and adults in prison. For the past three years, I have overseen and facilitated The Cancer Mosaic Workshops for Indiana University Simon Cancer Center and have created mosaics with cancer patients, their caregivers, and doctors and nurses at IUSCC. In all these experiences, I have witnessed people acknowledging their feelings of being shattered by illness, violence, abuse, loss, grief. And I have also heard people describe how the pain of these experiences gave them the gift of being broken open to deeper love, fuller living, authentic healing. I have come to understand that we “… must be broken open and remade, perhaps many times, to come to awareness,” as art therapist Pat Allen says in her book, Art is a Way of Knowing. On this past Saturday, November 14, 2009, as part of Indianapolis’ Spirit and Place Festival, a group of people experiencing major illness and/or life changes gathered at the IU Simon Cancer Center to create mosaics. We began the day with introductions, writing, and storytelling about our experiences of job loss, a rare bone disease, lung cancer, breast cancer, loss of loved ones, long-term physical disability. We then wove the healing imagery within these stories into collaborative mosaics. 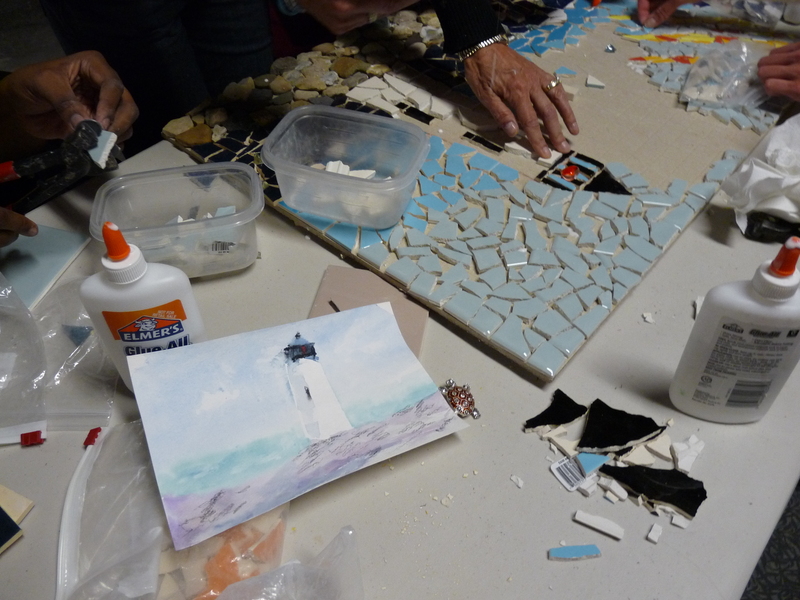 In the photos shown here, several of the workshop participants are piecing together a mosaic of a lighthouse. The lighthouse symbolized to this group the ways in which, in the midst of their own sea-changes and rocky journeys, there have been people and places that shone a light for them, guiding them, helping them find their way. The lighthouse also symbolized for the group the ways in which they have given a guiding light to others. I sometimes imagine no longer having to haul numerous heavy boxes of tiles around the city, even the state, in order to bring mosaic workshops to interested groups. But there will always be suffering in the world, in my life, in yours. And rather than trying to trying to ignore the pain of living, or to deny it, or defend myself against it, I chose to live and work in a way that both does not create unnecessary injury , and also compassionately accepts the pain that is here, now, offering us growth, change, healing. It is because of this choice that I continue to provide community mosaic workshops. I will be facilitating Cancer Mosaic Workshops for cancer patients and caregivers on March 6, May 1, July 10, and October 30, in 2010. Additional information about these workshops and how to register can be found http://www.cancer.iu.edu/mosaic. 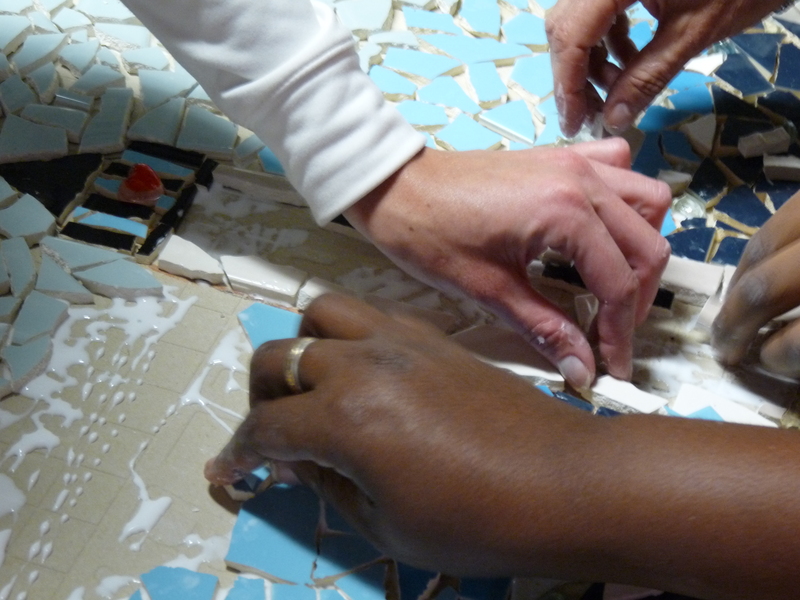 For information about scheduling community mosaic workshops for other groups, please contact me directly. Recently, five women gathered at Enbarr Studio for an eight week course – Beyond Burnout Prevention: Creative and Spiritual Renewal for Social Service Professionals. Over the weeks, we talked about our work as therapists, social workers, school counselors. We acknowledged the grief, the frustration, the worry and the exhaustion that comes from such work. And we acknowledged our own dreams, our need for nature, our search for what is wild and alive inside ourselves, our deep longing. Every night, after checking in and talking about readings related to depth psychology, art therapy, and eco-psychology, we made art. And we began to see that our images are alive, with much more to tell us than could be grasped in only eight weeks. We met in our art work women with wings, birds, animal people, moving colors, mountains, rain and trees. On the last night of our time together, we brought to the studio everything we had made and we spent the evening looking at it again, seeing connections in each others work and our own. More than one person said that the greatest gift of the group was learning that creating things together in community holds a power that is missed when trying to create alone. After everyone carried their art back out into the night and drove home, I stood in the studio feeling how full it was with life. Here are some of our living images. In case you are wondering, Enbarr Art Therapy Studio is named after a horse from Irish mythology who carries riders from the immortal land of Tir na nOg to the land of men. Enbarr means imagination, a fitting name for a wild being who travels between two worlds. Such travel is what imagination does. It connects the world of dreams, images, soul to our waking world, our ordinary consciousness. I have always been drawn to Irish stories, music, and mythology. This spring, after having a dream in which a musician skilled in Irish music gave me a horse for which I needed to make a home, I began immersing myself in the story of the harper Oisin and his travels to and from Tir na nOg. It was through studying this story that I learned of the horse Enbarr. My studio has recently gone through a few major moves in the wake of my own travels, and so it was in need of a new name to honor the new home I have made for myself, my work, and for imagination in the world. I hope to see you soon at Enbarr Art Therapy Studio! I want to describe what happens in what I consider an ideal art therapy session. My hope is that visitors to this blog, and potential new clients, can glimpse how I work. The following story is an account of one session with a fictional client named Claudette. Although Claudette comes from my imagination, she is based on what I have experienced working with women like her for over 20 years. She is fictional in order to protect the confidentiality of my clients while also describing, in story form, what could really happen in an art therapy session. Imagine Claudette, a divorced woman in her mid forties, seeking therapy from me after a relationship ended. In our first sessions together, we talk about her feelings of being unsupported and unnourished in most relationships, especially after her mother died when she was 16. We are currently exploring how she under-supports and under-nourishes herself through restrictive dieting, and not pursuing career goals. For homework this week Claudette has journaled about what needs to be fed and supported within herself. Today she comes to therapy with a written description of a dream which she had after writing about her nourishment needs. In a dim, dusky place, there is a solitary tree with a large hollow cavity, like a small cave. The tree is old and dying. I feel drawn to it and realize the tree wants me to enter it. As I do, I realize the tree is – at heart – young, feminine, and very sad. The tree needs me to cry because it can’t. My tears fall on the ground within the hollow place and the ground changes from hard and dry to soft and alive. The tree drinks in moisture now and grows younger, filling in with new wood. I am afraid that I will be trapped inside. But the tree tells me to wait. I feel a glowing, warm energy and strength. The tree’s new heart begins to undulate, like muscles gently pushing me out, and I step from the tree into a bright day-lit forest. The intensity of the dream frightens Claudette but she feels unable to forget it. She had vivid dreams when younger but over the years her dreams seemed to fade. Claudette wants to create the tree in the dream because she knows it is her. She feels old and dying on the outside but young and deeply sad inside. The weeping in the dream is what scares her the most. But she wants to feel the energy and strength that she had in the dream and the new born hope with which it ended. She works intently, quietly, urgently using paper, collage materials, oil pastels, to piece together her tree. I create a tree also. As I work, I think about how often trees occurr as healing symbols in client’s art, and in my own. I am struck by the dark center in what we both have made. This dark hollow makes the image more powerful, just like truly grieving connects us to the soul. Claudette describes her tree as “coming back to life” and points out the “old, grey haired woman” side of it next to a younger, colorful self. She wanted the hollow place to remain unfinished. We talk about how she is becoming conscious of her own sense of emptiness and loss and that it will help her stay present to those feelings by allowing the tree its hollowness. We also talk about the tears she will need to shed as she becomes more accepting of her own grief. Claudette acknowledges that she feels ready to “go there” in our future sessions. We talk about how we can use the imagery of going inside a hollow but also motherly tree to help set the stage for her grief work in future sessions. She takes the tree sculpture home with her with the intention of setting it on her desk and writing a dialogue with it before our next session. You are currently browsing the Expressive Art Therapy and Dreamwork with Liza Hyatt weblog archives for November 2009.